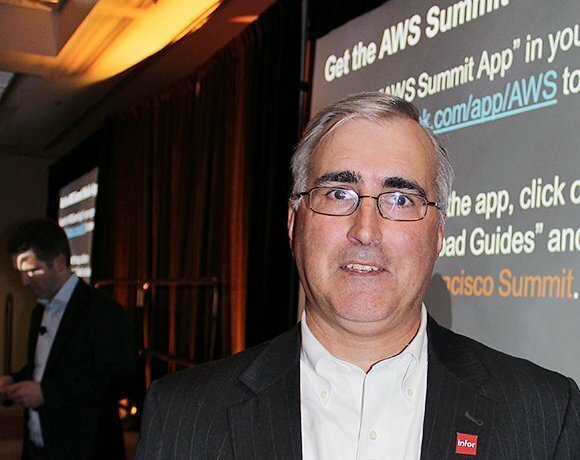 Infor announced its CloudSuite-to-Amazon plans at the Amazon Web Services (AWS) Summit in March, so lending its voice -- via Infor Labs senior VP Brian Rose -- to a session on partnering with AWS there was fitting. CloudSuite is an application portfolio package tuned for specific vertical industries. AWS supports rapid deployment of new cloud services, but the need for speed isn't AWS' only attraction for Infor, Rose said at the Summit and in a post-event SearchAWS.com interview. One plus is Amazon's cloud market leadership in the Infrastructure as a Service and compute capacity. Other benefits include Amazon's strengths in industry standards compliance, global reach and innovation track record. AWS' open architecture approach provides support for easier transitions from on-premises to cloud infrastructures. That's critical, said Rose, because Infor has 70,000 customers making decisions now about upgrading from on-premises deployments to the cloud. "Over the next five years, our on-premises customers will be migrating to cloud at a rapid pace," Rose said. The global reach of Amazon Web Services is a must for Infor, which plans to provide CloudSuite solutions everywhere. Amazon has ten regions with 25 availability zones, more than other cloud providers. Infor can use multiple zones to provide customers' disaster recovery and availability requirements, Rose said. The capabilities that come with an AWS partnership will help Infor's customers make decisions required for a cloud migration. "Cloud migration is about transformation and not just from an IT perspective," Rose said. Cloud can change employees' roles and job descriptions, and they need to be sure of the platform. The quality of a cloud provider's performance, security and scalability are still concerns. Infor's work alone brings "more proof points in these areas than we had, say, even a year ago," said Rose. Adding Amazon services will make customer assurance easier to obtain. Infor will roll out all 12 of its vertical CloudSuite offerings over the next year. "Taking advantage of AWS' open architecture and open stack will be a main focus, because both help us provide easier migration paths and low TCO [total cost of ownership] to our customers," Rose said.